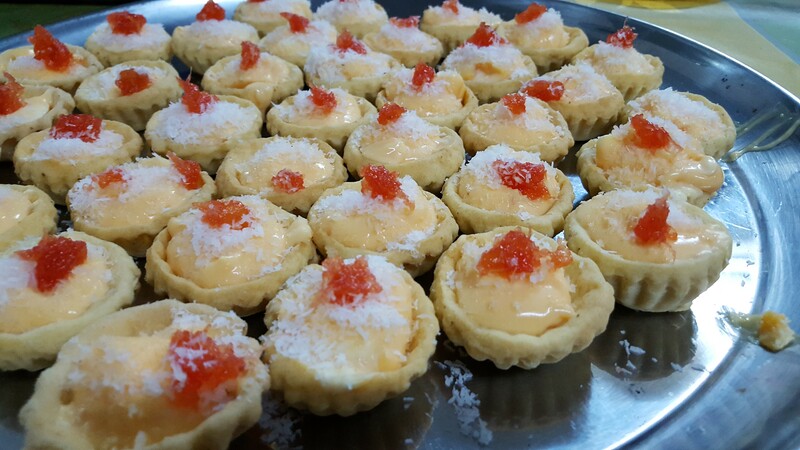 Puits D’amour is a mini tartlet very famous and popular and can be seen in almost all patisseries across the island in Mauritius. Here I have my two little apprentices helping me – Baking with kids is so much fun, here as you can see how much interaction we are having while I get my junior master chefs to help me. Kashina & Loushna are my gorgeous nieces who are keen to learn the trick of the trade and happily mastering the skills. Get your kids involved from an early age and watch them develop. 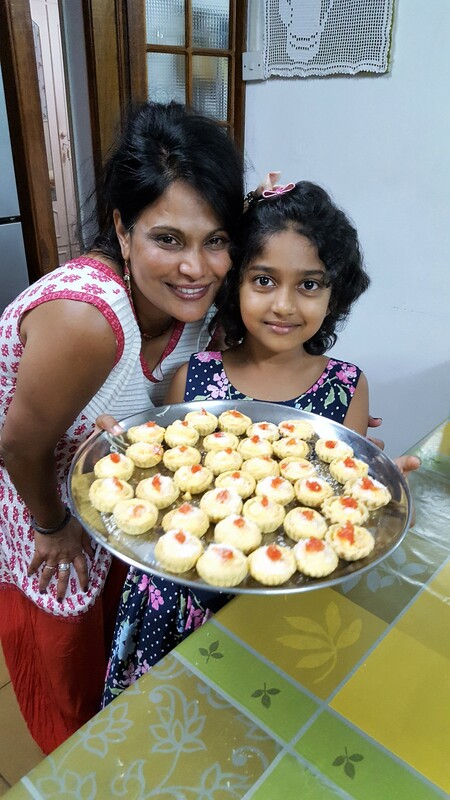 It one way to get children understand and enjoy the benefits of homemade food. It’s a little treat that can be enjoyed anytime in the day. To note you can make as seen above mini “Puit d’Amour and served as petit fours at birthdays or dinner parties. 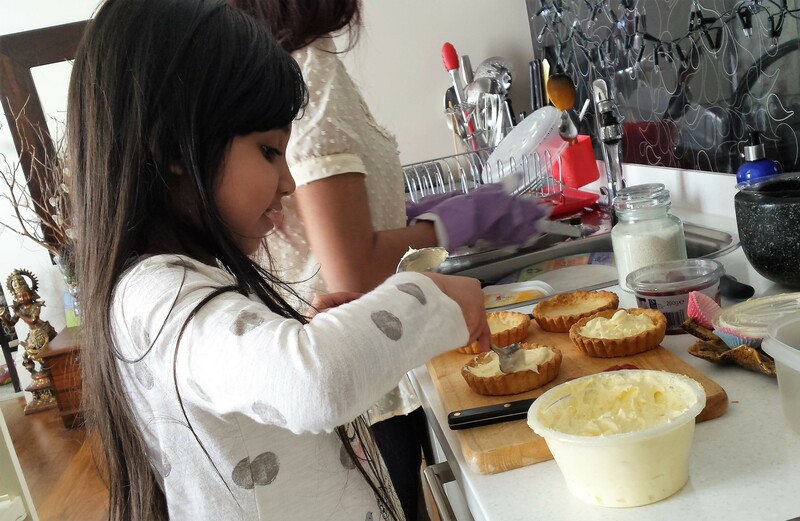 Just like many Mauritian cakes these mini tartlets have a blend of cultures. 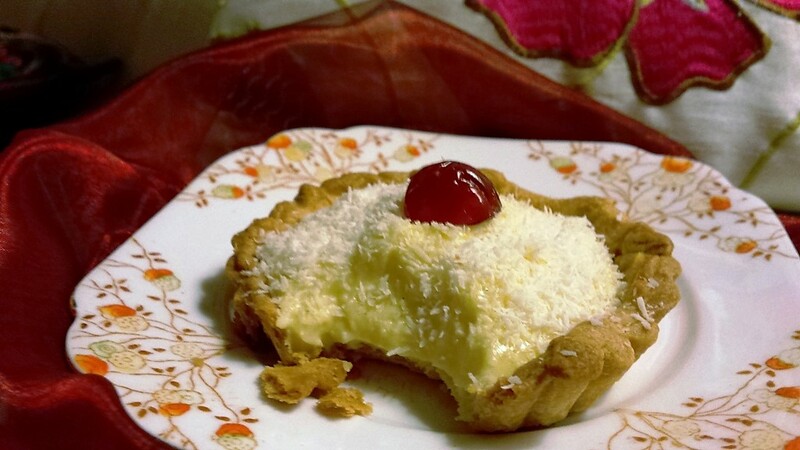 These cakes have a combination of the French sweet crust pastry with the ever loving “Crème Legère” and coconut topped with a cherry. With such great combination of soft textured and melt in the mouth pastry we have these super delicious little petit four delights which we have proudly named “Puits D’Amour”, which is literally translated into “well of love”. You would understand why this is given the name until you bite into these adorable tartlets. 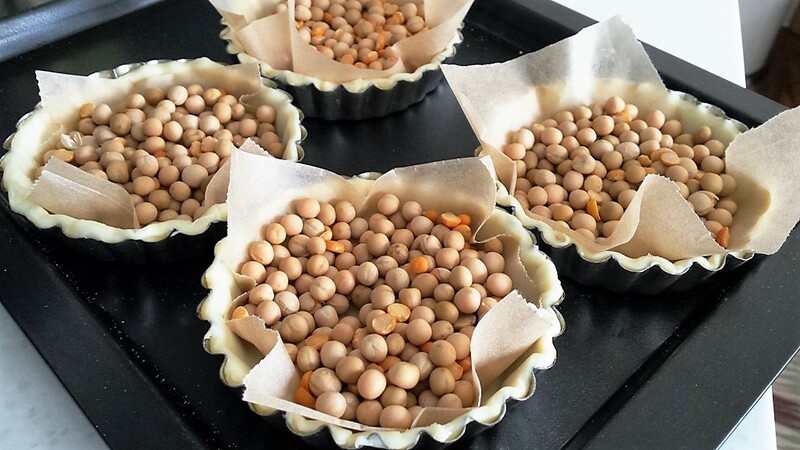 I use a ready-made Sweet Crust Pastry to make my “Puit D’Amour” and for the filling I like to fill those tarts with a “Crème Legère”, custard and double cream. So here for you all cake lovers or anyone looking for a nice dessert give this recipe a try! I can guarantee that you will not be disappointed. 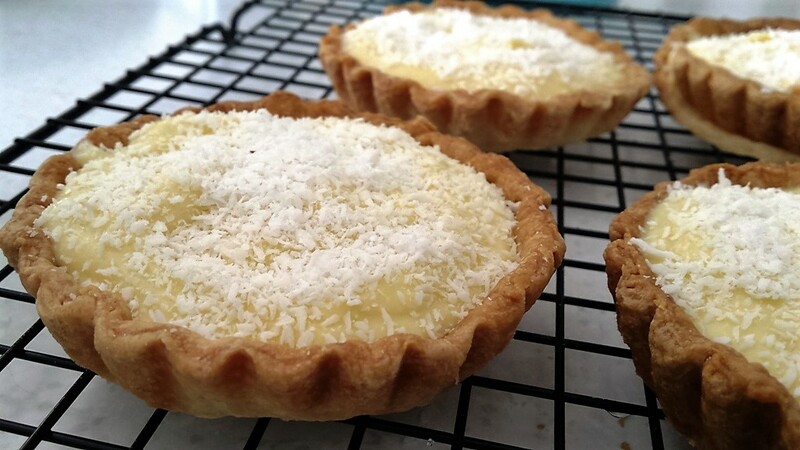 These combine my favourites of all pastry, cream and coconut – so how can I not like them. 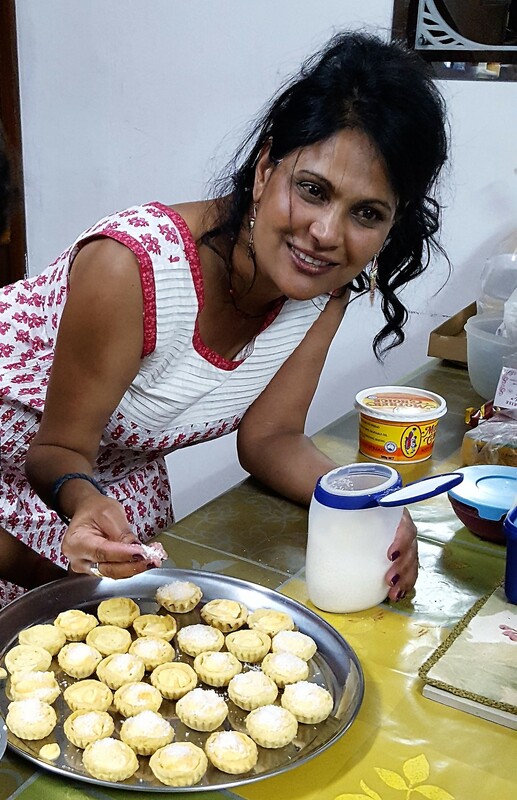 These tartlets look like the “Manchester Tartlets” but with the Mauritian twist to it – Delicious is the other name for these beauties. Although this is a very simple recipe but you will notice I have divided it into step by step. This is simply to make it easier to follow in an orderly manner. Start by preparing the base for your Puits D’Amour, which is the sweet crust pastry. If using readymade short crust pastry this is straight forward just roll and cut into shape. In a large mixing bowl, sift in the flour. Add the unsalted butter cubes. Using your fingers rub together the flour with the butter until they resemble coarse bread crumbs. Make a well into your crumbled texture. Stir in the sugar as well as the egg yolk. With your finger tips, mix everything well. If needed use the palm of your hand to mix everything well together. Finally, stir in around 2 tablespoon of water, 1 tablespoon at a time, into your mixture. Mix well to form a soft dough. If the dough is too dry, add 1 more tablespoon. But be careful not to add too much water. Cover with cling film. Allow to rest for 30 minutes in the fridge. In a deep bowl, add the egg yolks and the sugar. Using a hand whisk, vigorously whisk the egg yolks together with your granulated white sugar until pale and creamy. Add in the tapioca starch/ flour, whisk well then put aside. In a non-stick pan, stir in the milk. Bring to boil, cut the vanilla pod in half scrape the seeds and add to the milk. As soon as it starts boiling, remove from the heat. Take around a ladle or 1/3 of the simmering milk and pour into the egg and sugar mixture. Beat vigorously bearing in mind not to let the yolks to cook but to be only incorporated into the milk. This step is crucial because we are doing what we call as “tempering” the egg yolks so that when poured into the rest of the milk it doesn’t cook and become scrambled eggs type like mixture. When Done, Stir in the remaining milk into the egg yolk mixture. Whisk well with your hand whisk. Pour the mixture back into the pan. Bring back to boil then lower the heat. Over medium to low heat, keep on stirring continuously, to avoid it from burning and sticking to the bottom of the pan. Cook until a thick consistency is obtained. Transfer the “Crème pâtissière”/ custard into a bowl. Cover it with Cling Film, making sure to make the cling film to touch the top of the Crème pâtissière. (The reason for doing this is to avoid having a thin layer forming on the top of the “Crème pâtissière”). Remove the sweet pastry dough from the fridge. Dust a little bit of flour onto the working surface. Dust a little bit more of flour on the top of the dough. Gently press with your hand palm. Roll the dough into 1 cm thickness. Using a pastry cookie cutter or simply a bowl whose diameter is slightly larger than your tart moulds to cut the desired shape. Line the sweet crust into your tart moulds. Using a folk, prick the sweet crust. Place into your preheated oven over middle rack. Bake blind for 17 minutes or until slightly pale in colour. Remove from the oven, place onto a wire rack and allow to cool COMPLETELY. In a deep bowl, add the double cream. 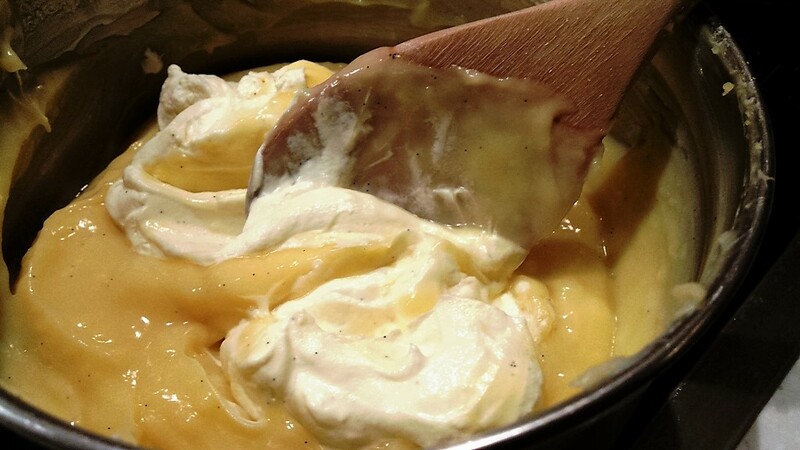 Using a hand mixer beat into “Chantilly Cream” or until soft peaks is formed as illustrated. Take half of the whipped cream and fold in into the custard. When well incorporated, mix and fold in the remaining cream. You should end up with a velvety soft textured, glossy “Crème Legère”. Pipe or spoon in the “Crème Legère” into the completely cooled tartlet pastry cases. Sprinkle with desiccated coconut and half glacé cherry on each Puits D’Amour. Place in the fridge and allow to set for at least 2 hours before serving. Serve as a dessert or a tea time snack. Brinda’s Note: Puits D’amour can be made with either short crust pastry or sweet crust pastry. As for the filling one can use creamy custard by simply mixing the Custard with double cream. Alternatively you can make a “Crème Legère” by simply by mixing up Custard together with Chantilly Cream (whipped cream) as described in my recipe. This makes a more airy and velvety textured cream.